In order to go on trips of several days in various locations you need a suitable backpack. Modern backpacks (with inner frame)-compared to old-style ones (with external frame)-are ergonomically designed to be comfortable, efficient, and provide good balance for the carrier. These advantages bring added safety to those who go on mountain hikes, whether for a day or longer. Modern backpacks have an inside frame, with one or more bars made of aluminum. Whether you are a hiker, skier or climber, this kind of reinforcement helps you maintain your balance more easily on rough terrain. For overnight trips it’s enough to have a 30-40 liter backpack, but for a three-day tour you need a backpack with a capacity of 40-50 liters. Some models can reach 100 liters. Beware, however, that as a rule the larger the backpack, the more weight you carry. Consider your real needs carefully. The choice of backpack/rucksack size is very important. Large volume backpacks, used on trips of two or more days, are necessarily backpacks with a rigid back. This means that the back of the rucksack is stiffened with a metal bar, which causes the weight to be transmitted to the hip, the most enduring part of the body. The framing bars found inside the rucksack are typically bars of aluminum with a width of one inch and a thickness of 3mm. The bar or bars can be taken out and molded according to your body shape. Flexibility – Interior frames give your backpack firmness, thus the backpack adapts more easily to body motion, which in turn gives the hiker, climber or skier more ease to move. Balance – These backpacks closely envelop the body so the weight carried reaches closer to your center of gravity, which helps to better maintain balance, for instance when you pass through rough terrain. Stability – These backpacks are equipped with compression straps which can be tightened, or they can allow other objects to be firmly attached, preventing the backpack or attachments to have a life of their own. This gives the wearer a good stability, and can keep your balance in extreme situations. Freedom of movement – because of the inner frame, the shape of the rucksack is usually narrower, making possible the free movement of the hands, which is a reason why these backpacks are popular among climbers and skiers. This narrow profile has a huge advantage for hikers as well, when passing through a narrow place or through the bushes. Easy adjusting – the inner framing, together with the shoulder and hip straps are more easily adjusted, than in the case of classic backpacks. Simple backpacks usually have no bars or framing on the inside (you can find some models with a semi-rigid back), have a load capacity of 20-40 litres, and are usually used on 1-2 day trips. The fabric used is usually a tough one specially made for backpacks (sturdy nylon), or Cordura (a tough, somewhat coarse material). Both fabrics are resistant to wear and tear and to water. Cordura is more resistant, but slightly heavier. Most backpacks have a removable top part (lid), which is a pocket, and thus reduce the size of the backpack. 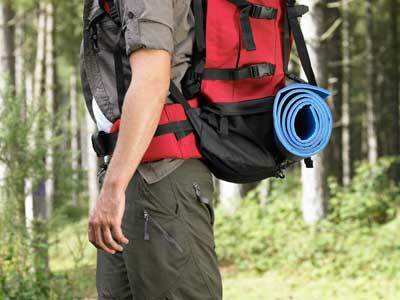 This is very practical especially when you’re going from the base camp for a one day hike. Some backpacks have fixed side pockets, others removable ones, while at others they may be hidden. Attachment points make it possible, when needed, to attach several objects onto the backpack. For climbers, especially those who do excursions in winter time, they need to attach an ice axe, carabiners, snowboots, etc. The majority of the rucksacks allow for top-down packaging, which requires that things needed the most (e.g. raincoat) be kept as close to the top as possible. Some rucks are equipped with a zipper on the underside, allowing direct access to the sleeping bag without having to unpack the entire backpack. What is the ideal size? 30-50 litres: is ideal for two or three day trips. 60-80 litres: is used for longer trips. Pay attention to this self-evident but often overlooked rule when making the purchase: the larger the backpack, the heavier the load you have to carry. Do not neglect the weight of the rucksack! Large backpacks weigh about 2.2 kg/5 lbs. Remember before the first hike to adjust the backpack. It is recommended to begin with just a short trip with a new backpack. During stops, make adjustments as required. After some use, the frame will conform to your body. How to pack a rucksack? Whatever the road conditions, pack the heaviest things as close to your back. On mild terrain, pack heavy things high in your backpack. That way the weight falls on the hip, a body part that best supports weight. On rough terrain, conversely, pack heavy things low, so the body’s center of gravity is as low as possible, which will give you stability on the way. Always put your sleeping bag at the bottom of the rucksack, and next to it pack all those things you need just for sleep. Tighten all the straps well, so the backpack is firm and stable. Shorter men and most women, regardless of road conditions, prefer to pack the heavy stuff low. You decide how you’re more comfortable. Try several packing methods to see which is best for you. Make sure that things that you need more often are wrapped in easily accessible places! Do not leave holes. In pots put small things. Food should be spread over several smaller packages, instead of in one lump in a bag. If you’re accompanied by other people, divide the heavy things (e.g. tent) among you evenly. No one should be the “sherpa” of others. Hang as few things as possible on the outside of the rucksack because you will become more unstable. If you still attach a few things, tighten them up to not run loose. E.g. the tent sticks can be placed horizontally on the backpack along the foam mat, or sideways bound with the side straps. The loop for the ice axe and daisy chain was specially designed for these pieces of equipment, use them creatively, but don’t risk your comfort and balance. Always carry a waterproof sheet to cover your backpack. The backpacks are typically made of waterproof material, but the zippers and seams are not as waterproof. In the event of heavy rain, water may seep in and the contents of the rucksack will get wet and heavier. Pack your backpack the day before, or do a test packing a few days before the trip; if you’re missing something it’s good to find it out ahead of time. Do not store your backpack in dirty condition (muddy), thus preventing the premature deterioration of the material. The rucksack should be washed with warm water up to 30 degrees Celsius / 86 Fahrenheit. Clean the backpack with a damp cloth before storing, but never deposit a backpack when wet, to avoid mildew. Store your backpack in places protected from moisture. Take good care of your backpack, so it will be your trusted partner for a long time to come. Looking to buy a backpack? Check out our highest rated backpack list and make an educated purchase!